Amazon Assistant knows all about you - gHacks Tech NewsAmazon Assistant is a service by Amazon that is offered as a browser extension or mobile application designed to improve the Internet shopping experience. Its main features are product comparison, access to Amazon's wishlist from any website, the highlighting of daily deals on Amazon, and a search. Amazon Assistant is a controversial product. Amazon's New Price Comparison Tool Is Here to Make Sure You Don't Overspend This ChristmasHoliday shopping is exhausting enough. Doing all the legwork to find the best deal just makes it all the more taxing. And the credit card bill come end of December? Yikes. 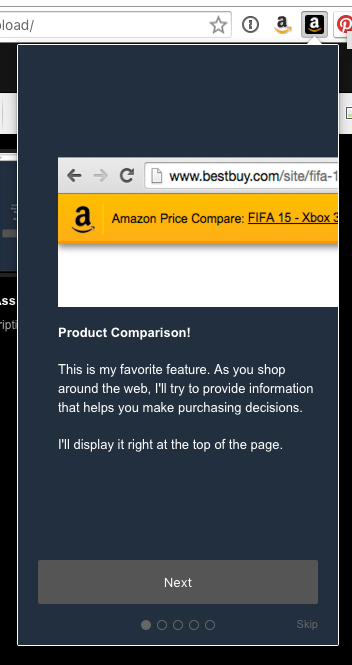 Well, if you're on a budget, we've got a hot tip: Get yourself Amazon's new browser extension: Amazon Assistant, while lets you easily compare products and prices right on the web page you're visiting. Would you recommend Amazon Assistant to a friend? @chrismessina If you click through that walkthrough, you'll get to a point that says something like "In the future I will be able to tell you when your order ships". That is going to be pretty cool. @fosteronomo Not quite but those guys did a good job. Serious question (as I have too many Chrome extensions to try new things out easily): Is this worth me switching from InvisibleHand?